One November fifth under seas of stars, a dance-theater group was performing poetry by a fire near a pair of sweat lodges. Kalaea read a poem by Donald Howard to accompany a sword dance, the first piece I had created for public performance two years before. The sword might seem a perilous dance partner, but it had demanded the focus I needed to begin dancing for audiences. This time, however, the peril was another altogether. As I bent back with the sword balanced on my waist, I was laid open to the stars, terrified for an instant that they might seize me up and I’d fall out into blue, unfathomable reaches. Fortunately for the dance and the audience, I reeled myself back in. The experience of time changes in outer space. But past, present, and future are nonlinear: merged and encapsulated in the tastes and scents, memories and sounds, of the living system of Earth. Our biological rhythms are profoundly attuned to this. We are often a little jarred by clock-time. Children often play with time and space in a flow that resembles dreaming. I attended an elementary school perched on a hillside bristling with shrubs and bushes, trees and vines. The building was a massive Greek revival structure, the oldest on the East Campus of Western Michigan University. An upper playground was paved in blacktop, but graced also by enormous oak trees. The lower playground was a conventional turf field for various games. Between them stretched the liminal, forbidden space of the Bushes. Needless to say, some of us were most attracted to playing there. It was a world of tunnels and caverns wreathed in branches. Little purple-blue Concord grapes grew on vines. To pick and eat them was a sacrament of sorts. They were sweet and sour and concentrated, rich in their power to connect us eternally to a system that no longer exists on this hillside. My best friend and I played in the roots of a tree among those vanished “tunnelscapes.” We made a chokecherry potion named Zish, mixing it in root hollows. We leaned over it, imagining ourselves as witches, muttering and stirring. Our roots were interwoven with those of the trees. Many years later, in 2006, Jennifer Kovach, Matt Raven Rogers, and I sought locations for outdoor dances. We gravitated toward a bridge: the M-14 overpass. Under it, a floor of reddish-tan earth edged with stones and tall grasses slopes gently to the river, punctuated by angular columns supporting the highway, with a pier next to the water. The oceanic sounds of vehicles overhead resonate in the concrete long after they have passed. The impetus to work outside had begun a few years before. The group had presented a program at a private fire circle. Waiting in the woods, we were startled by a long breath of wind on an otherwise still evening. Leaves floated by. The ensuing performance seemed to be exhaled from that sigh of wind. During the previous summer, Kate Mendeloff’s drama classes at the University’s Residential College had presented Shakespeare in the Arb for the first time. Their interaction with trees and fallen logs, flower gardens and steep hillsides, the fairy children throwing acorns and cones at the audience, had been inspiring. Three years later we were dancing in the Arboretum, too. And again the wind breathed on us during a piece in which I played a fox-spirit based on the Japanese Kitsune legend. In the character of a wandering musician, another dancer, Ben, lifted a flute to his mouth. In a mighty wind-shiver, a rain of autumn leaves showered onto the sun-glowing grass around him. Our exploration in merging human dreaming with nature intensified; we continued to experiment in various locations. At the Matthaei Botanical Gardens, flocks of geese seemed to synchronize their flight with upraised arms and pour through the sky from the hands of a dancer. Kalaea swayed in a bed of tall grasses, and the wind rose, tossing the scene into a sea of auriferous tumult. A hawk hovered over percussionists, and I wondered later if their sound reminded it of thunder, which might bring lightning, starting fires and flushing out food. In 2006, at summer solstice and with almost no advertising, we drew people of all ages from around a park. Laurel Reynolds read poetry. Jennifer and I danced by and within the river. We poured into it a stream of spring water from a circular brass bowl that shone like a sun-disc. In July, at a green-lit grove in Eberwhite Woods, we placed thrones for the honored audience, draped them in colored fabrics. We strained light through us, emerging from a melding with trees, growing, pulling up from center, from ground. Drawn into sunlight that filtered to the forest floor, we took hands and danced, then parted to retreat to our trees. Later we took goofy goddess photos in the neighboring Project Grow garden. Finally came the Bridge performance, in August and September. It was demanding because of the magnitude of the space. The area extends from a rock-lined border near the park road, then down a slope under the massive bridge structure to the edge of the river. It was necessary in our performance to have the audience travel with us, first facing toward the road, then moving the seating to face the river. We called the performance piece a “myth-history”: a voyage through time and story. The size of the area brought out the sense of timeless myth and ancient history. Each smaller element of the space also had its own peculiarities. They became fascinating up close, and contributed to the rough-hewn beauty of the whole. We moved through a desert seamed with cracks where water had run and weeds grown. Gravel lay in rough patterns, inset in one place with broken green glass. Hedging either side were tall prairie grasses, flowers, trails into woods. Even picking up garbage before the first performance gave a sense of beachcombing on some eternal shore. A rock sculptor paddled by in a red canoe and balanced another stone on each cairn. A caterpillar with green-white bristles and little horns, almost luminous, crawled toward my foot, sniffed it and moved on. I watched motion ripple through it. Into the night we danced, partying after the show with tiki torches alight, candles and lanterns and firepot glimmering, mirrors in mirrors of shadow-fire-and-water patterns. The earth beneath the bridge had become a place of ancient yet new artifacts, with us there, living, ephemeral yet ageless. In many marginalized cultures, dreaming is valued, attributed to all life, to the stones and the earth itself. The environment is respected for its sentience. A practical technology, a relationship with natural elements and an imaginative storytelling are woven and resonate on many levels at once: a merge, a relationship, not an imposition. Dominant world religions separate earth from sky and idealize a detached celestial realm. Science values objective detachment. Could our emphasis on accurate observation be enhanced at times by a participation that brings creativity into play, an acknowledgement that we can separate ourselves from neither nature nor imagination? The beneficial part played by microbes in the balance of life is being acknowledged: the imperative to befriend, to relate. The cyan dream of prokaryotes, from which the living world once sprang, possibly more than once; into which it could retreat if seemingly destroyed, then emerge again. The prevailing story of frightened human ancestors may not be completely accurate. We may have lost a sense of glowing unity and guidance from these connective, creative elements.Stories suggest that nature spirits covet and envy human art and artists. The Irish fairies, Leanan Sidhe, inspire and destroy minds. There is danger in straying far from human community. But when society is spiritually estranged from a conscious link with the interwoven lives of all species, this haunting can become irresistible to those who cannot deny the creative wellsprings that rise in them. Creativity has become human nature, and broken bridges ask to be mended. I pick up a green acorn. I listen to it. My brain translates: “So much electricity!” The trees of telephone poles, a strange sprouting of towers transmitting forests of signals: perhaps they do not go undetected by the plants and their child-seeds. The interiors of landforms are often places of retreat and vision quest. On our continent, the interior has been largely appropriated by functional systems of infrastructure that hold together the nation at a basic level. Agribusiness, mining, hydraulic fracturing, even many bureaucratic tasks are relegated to land that once was prairie and inland forest. But the land-spirit still breathes at night through dry corn sheaves that harbor something sentient and bristling. Train whistles recall soul longings. Waves of farmland lap night roads edged by giant trees, whose shadows envelop a car swishing by them and release it again into the glow cast by headlamps or moon. In Ann Arbor, in Island Park, the river curls around the namesake island and embraces smaller ones. Children become water goddesses with the pillared pavilion as their temple. Cat-masked sword fighters practice on green grass. The forested hill embraces the river, the high trees framing light in lacework of branches, a vast cathedral. Our first dance there we named “Helix, Spiral to the Stars”: a story of two related, severed tribes in conflict and their reunion. The finale was led by Kitsune, who is now a frequent participant. She lights meandering paths of luminaries at dusk, luring audiences to follow them to a different slant on the world, where the coming and going between realms is available to our senses. Playing Kitsune, basing her motions on a study of foxes, their leap and freeze and pounce, their orientation to the northeast that might align them with electromagnetic fields in a manner conducive to hunting, shapes something fiery hidden in the bones that may enter the experience of another through the links among all. Kitsune, blending with shadows, a creature made of fire that can take any shape at all, is a quintessential dancer. Another event was transpiring in the park as we worked out the Helix story. The participants were not human. I did not know what to make of the images that formed in my mind. A giant man, his face and body painted white all over, was kneeling on the grass, bending his head toward the ground. Near him were more tall entitles: a green woman, a pair of lovers. I saw them as fragments of a drama unfolding, but there were no clues to their story. Months later, in the winter, I returned to the park and saw dying ash trees there. One tree was just where the white-painted giant had been bending to touch his head to the earth. An intertwined pair of trees were in the location of the lovers. Another stood in the place of the Green Woman. By a year later all those trees were gone. Were the giants I saw the way my mind interpreted a subconscious sense that the trees were dying? Were they the spirits of the trees, personified in my waking dream? I only know that they presented themselves with vivid force. Year after year we returned to Island Park. During one annual dance in the river, there had been a storm the night before. When we arrived at the park, the water was low; the dams upstream had been closed. Suddenly, it began to rise with rather alarming rapidity as they were opened an hour before we were to begin a program. I was the first to walk into the water. Intending to begin as usual in the middle of the river, I felt the water instructing me, tugging around my ankles. No further. I tried to push it. Nope. Stay here. I obeyed. The three youngest, age eight to thirteen, danced near the bank. We all felt the high water calling on us to merge with and extend from it in a way that has not been equaled since. Always, no matter how deep the river, it welcomes us. This is a participatory dance. Anyone attending may join, or witness. Our hands move with flocks of birds. We’re often watched by ducks and the blue heron. We move with the current, occasionally resist, then splash water in diamond sprays, returning it to clouds. Nothing is really ordinary. Dreaming consciousness can encompass the green life and the human artifacts of a neighborhood residence. Early in the morning, sunrise bathes a baby swing among great pine trees as though blessing it for the day. A purple ball lies on the grass, a celestial marble in a game too big to see the whole. For our most recent performance, Birdtribe Eternal, we chose the Cascades, an area that evokes the harnessing of water for electricity. If you listen closely you can hear generators humming. We asked the audience to sense another hum in the ground beneath their feet; to imagine they might detect the magnetic field generated there and let it guide them as it probably once did our ancestors. Bird-shaped clouds flocked overhead, and herons rose from tree branches. There were ducks in the audience, too. The blue heron is our sentinel, watching us from across the river, claws of ancient inheritance splayed on a fallen branch. In the winter of 2012, in the lower Great Lakes, there was only a dusting of snow: a sparse fur barely covering bleached-blond grass. During a tornado on the sixteenth of March, the temperature was eighty degrees. In staccato bursts, hail spattered down like salt from a shaker and rattled intermittently on the streets. Two years later, heavy snows returned, and an ice spell was cast on the Lakes. Aerial photos presented sheaths of solid white hatched over by wind-raked lines. Underneath that coarse and shining armor, stacking itself in rigid heaps and ephemeral caverns on northeastern shores, slept the blue dream of summer. Exactly then, a documentary about the recent loss of ice on the Lakes was being edited into its final form. It was screened a few months later at the Michigan Theater. I thought about the irony of the deep freeze. On the screen lingered a photograph: island dwellers, sailors, ice-fishermen from a hundred years ago when the ice was a reliable visitor. One of those sailors stood beside me for a moment in the darkened theater. He was watching the film. I sensed and then dimly saw him, his long snowy hair and long black coat. I realized that a little crowd of them were there, standing in the aisles, bearing witness, blending with shadows thrown by chairs and human figures. The woods allure from a distance, and they do not disappoint when you arrive among the trees and wander. The secrets of the woods are the same as those deep in the bone. Is it too much to imagine that paying attention to ice can play a part in bringing it back? Or that the focus on monarch butterflies, along with greater physical care of them, is aiding their resurgence, while other butterfly species continue to languish? Maybe other beings like human attention, and miss the direct regard and love, the blending of dreams with the planet’s storytellers (us)…. A sound like a branch being broken in pieces drifts down from high overhead. We cannot see the blue heron flying in the night, tracing a bridge in the air. The next morning, Daniel Sheehan and I return to the park to make sure all evidence of our evening occupancy is gone. Just where our fire had blazed, one long, gray-blue feather lies on the grass. 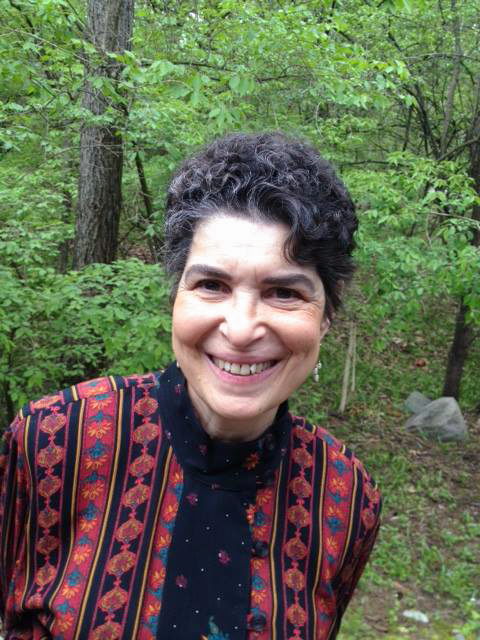 Irena Nagler writes fiction and poetry, teaches environmental movement meditation, and is a visual and performing artist with Nightfire Dance Theater and Ria Dance. Irena can be reached at birena@umich.edu. Posted on May 3, 2018 by Irena Nagler and filed under Art, Nature, Spirituality and tagged imagination nature dancing dreaming.